Selecting Top Talent – Don’t leave it to Chance! Selecting top talent is a key competitive advantage in today’s workforce. It leads to job satisfaction, increased productivity, higher morale and of course impacts positively on the bottom line. With such a huge amount at stake it is surprising that many organisations still select talent using only skills and experience. Even the best qualifications, experiences and skills do no matter if they are coupled with attitudes, values and behaviours that are not suited. PRISM Select Online is a unique, online system that compares a candidates behavioural preference and work aptitude with those an organisation has identified as necessary for successful job performance. PRISM Select Online is not a test. It focuses on the behaviours and aptitudes required for excellent performance in a job – it identifies high potential candidates. 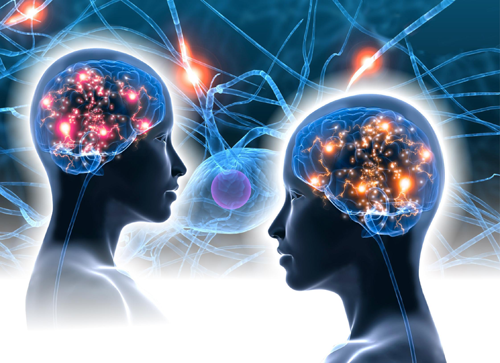 PRISM Brain Mapping is a sophisticated, online, neuroscience-based instrument specifically designed to identify the behavioural preferences that directly relate to personal relationships and work performance. 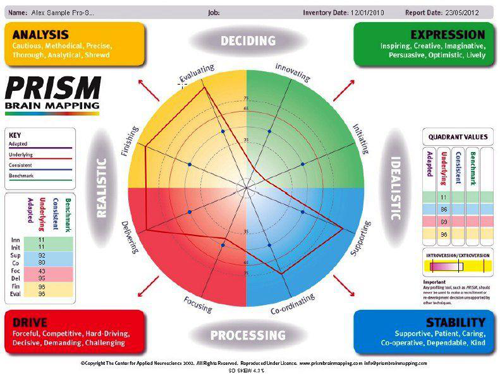 PRISM provides three distinct profiles, or ‘maps’, of a person’s behaviour: how he or she naturally prefers to behave; the extent to which he or she feels it necessary to modify that behaviour on occasions to achieve key objectives, and the overall pattern of behaviour that he or she tends to use for most of the time Click here to see a sample profile map. In addition to the eight behaviour dimension maps, PRISM generates up to a 50-page personalised report which identifies and measures 26 key aspects of work preference. Click here to see a sample professional report.